Family rituals are very important for children. Having rituals creates a loving environment where the children feel safe and loved. They know what to expect and know what is expected of them. It brings the family closer together. Most of us probably have holiday rituals and traditions that we pass on, but daily rituals are just as important, if not more important in unifying the family. I try to start things out right with my family by having morning rituals. This helps the girls know what to expect. My husband is at work when we get up (he is gone before 6am) and so it is usually just the girls and me. We have a few morning rituals that bring us closer together. The first, is a bit of snuggle time with the three of us. Having breakfast together brings us closer together. During that time, we watch the bird feeders to spot any new visitors. It is amazing how over the years, we have more and more species of birds that visit us. We also spend some time reading a devotional or a bible passage and talking about it. This sets the tone of the day. Dinner time is probably the most important ritual we have as a family. This is a time when we all sit down together and share about our day. The best part is that Daddy is included in this! This keeps us all up to date on what is going on and it is also a time to work out any difficulties from the day. I work as hard as I can to try to get us all to the table every night. Every night for the past 8 years, we have also had the ritual of the girls snuggling up with one parent and reading at bedtime. This is a great way to calm the girls down before bed while providing them with plenty of nurturing. Even when the girls are up late for a special event, we at least read a short story. Rituals are a part of our daily life and really seem to meet my daughters’ emotional needs. I am hoping that these rituals will help them to grow up to be secure, content adults. Now, I mentioned Tropicana Pure Premium earlier. This post is sponsored by them, but I accepted their offer because I LOVE this stuff! In fact, I think I am addicted to it. It is100% Pure Florida Orange Juice--not from concentrate. I remember when I lived in Sarasota and would pass the plant in Bradenton smelling the oranges from the factory. I also would see tons of trucks filled with oranges, headed to the plant. I started drinking the juice when I lived there and loved it. I have tried the other "100% juice" brands, but yuck, is all I can say. In my opinion, Tropicana Pure Premium tastes just like I picked an orange and stuck a straw in it. Which, is exactly the picture that is on the label. In fact, writing about this, I had to get up and have myself a glass. I especially love the one with the calcium and vitamin D added, since I can’t drink dairy products anymore. And, don’t let me forget about their sweepstakes. You can enter to win any of 100 Florida prizes, including a trip to beautiful Sarasota Florida (my old stomping grounds—this is an awesome place to vacation) to visit an orange grove. 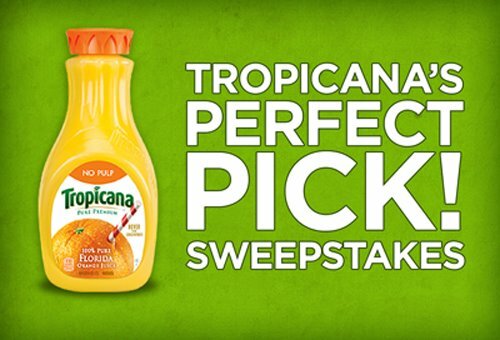 Ninety-nine winners will get a one-year supply of orange juice (12 coupons for 59 oz Tropican Pure Premium containers). 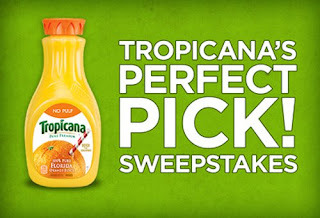 For official rules and regulations, and to enter, visit the “sweeps” tab on Tropicana’s Facebook page at www.Facebook.com/Tropicana. I have liked Tropicana on Facebook. Become their fan and stay updated! Disclosure: I wrote this blog post while participating in the SocialMoms and Tropicana blogging program, to earn My SocialMoms Rewards Points. The opinions and ideas expressed here are my own. To read more posts on this topic, click here. Thanks for stopping by my blog, I have already liked your facebook page in the past, so I'm now following your blog! Have a great week!